Remember To Keep Both Eyes Open. A View From Last Night’s Office. Copper Box Arena, London. 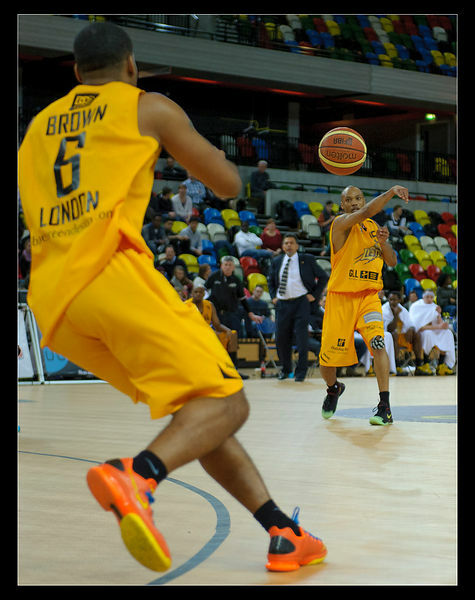 BBL Trophy Gane London Lions v Worcester Wolves. I'm really getting into shooting this basketball stuff. However, one technique I need to work on is shooting with both eyes open - being positioned so close to the court there is a very good chance I will get whacked by the ball or crunched by the players and just looking with one eye glued to the viewfinder and the other closed gives no chance to get out of the way. There was a moment during this shot when I thought I should put the camera down and catch the ball. Luckily, Rod Brown [#6] the Lion’s guard came into view and picked up the pass from [#15] Chez Marks. I think Vince Macauley the Lion's Head Coach [in the background with the tie] is really saying if that photographer catches the ball he is on the bench for the next game. Top of the league Worcester ran out winners 82-73 sadly putting the Lions out of the cup. Back again for the match against the Durham Wildcats on Thursday and hopefully a win.